Testors is the most-recognized and trusted brand in the hobby industry. Testors Enamel Paints can be used for virtually any hobby project, from models and miniatures to woodworking and arts and crafts. All Testors Enamel Paints provide superior flow and coverage for fast, easy application. They dry to a glossy finish and are ideal for use on a wide variety of surfaces, including polystyrene, ABS plastics, metal, pewter, brass, wood, paper, glass, and more. 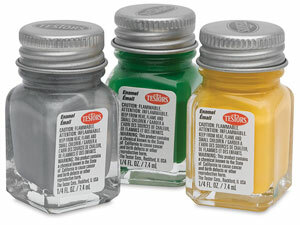 Testors Enamel Paints are available in convenient ¼ oz glass bottles, an icon of the Testors brand. Enamel Paint Set of 8 Colors — This all-purpose set includes eight colors in ¼ oz glass bottles, including Yellow, Red, Dark Blue, Green, Black, White, Gold, and Silver. Also included are a ¼ fl oz bottle of thinner, a paint brush, and a painting tray. Decal Setting Solution — This solution is used for decal placement over panel lines and protrusions, allowing the decal to stretch and conform to irregular surfaces. Setting Solution also allows you to move the decal after you have applied it to the surface, for precision placement. It can be used on most surfaces. Decal Setting Solution comes in a ¼ fl oz bottle. Thinner — Use Testors Thinner to thin paints to an air-brushable consistency, or to simply make thinner lines while painting. Thinner comes in either a ¼ fl oz bottle or a 1¾ fl oz bottle.